Mel Gibson's biblical drama film The Passion of the Christ both divided and shocked audiences nationwide after its Ash Wednesday release in 2004. 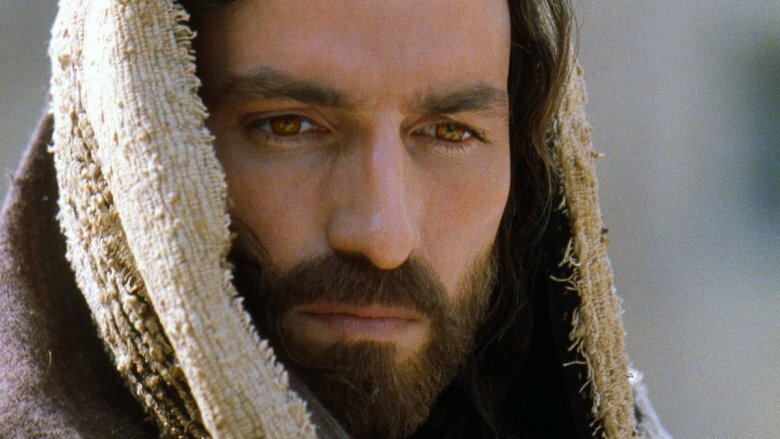 Primarily following the final hours of Jesus' life, the film was praised for its cinematography and performances, but criticized for its graphic violence and alleged antisemitic undertones. Regardless, it received three Academy Award nominations and remains the highest-grossing R-rated film of all time. On screen, The Passion of the Christ has its fair share of bizarre moments. 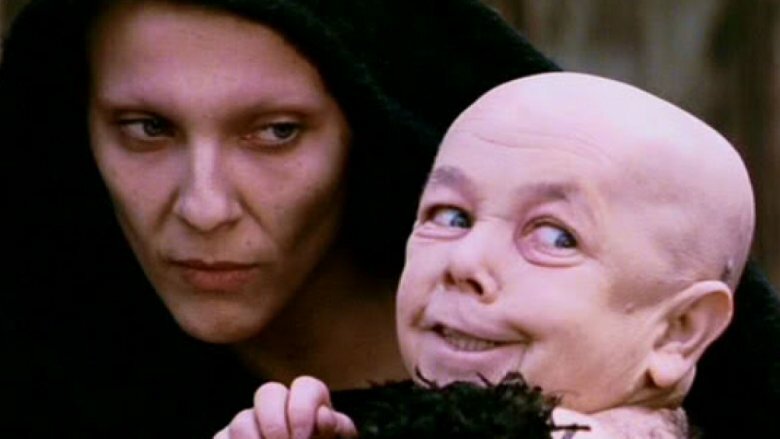 (Is there really a part of the Bible in which Satan carries around a Little Person?) And as surreal as things can get during the movie itself, there were also quite a few bizarre happenings behind the scenes — some of which you might not even believe. According to one study, lightning strikes roughly 240,000 people per year. 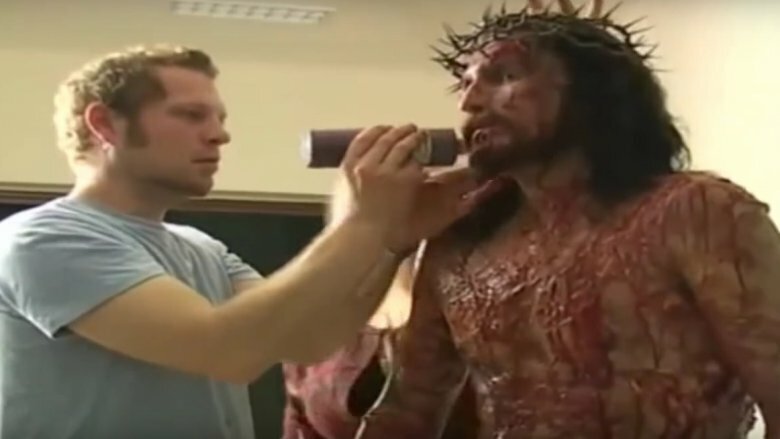 It's fairly rare, in other words — but in 2003, it happened three times on the set of The Passion of the Christ. Lead actor Jim Caviezel has claimed he was "lit up like a Christmas tree" while filming the Sermon on the Mount sequence of the film. "I knew it was going to hit me about four seconds before it happened," the actor told The 700 Club. "I thought, 'I'm going to get hit.' And when it happened, I saw the extras grab the ground." Caviezel said that after the strike, fire was coming out of his head and his body was illuminated — though the cameras hadn't yet finished panning over to his position. "By the time the cameras got to me," Caviezel recalled, "I hear Mel screaming out, 'What the heck happened to his hair?' I looked like I went to see Don King's hair stylist." Caviezel wasn't the only person on the set of The Passion to get struck by lightning. "Five minutes after I got hit," Caviezel explained, "Jon Mikalini, an assistant, walks over and says 'Are you okay?' And then he got hit. The difference was that they saw the bolt come down and hit Jon … All I felt was this giant tremendous slap on my ears and a few seconds of a pink, red static in front of my eyes." Unbelievably, that wasn't even the first time the assistant director had been struck on set. 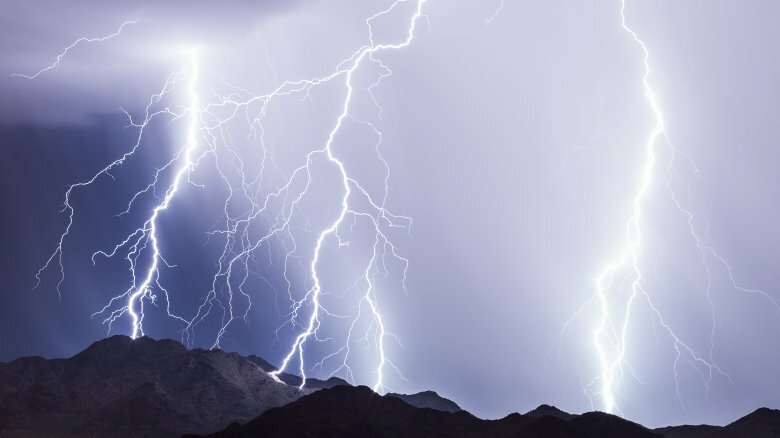 According to BBC News, Mikalini had already been the victim of Mother Nature's electrostatic discharge once before, when lightning struck his umbrella — luckily only causing light burns on his fingertips. What are the odds of that happening? An astronomical 1/11,728,889,000,000 if you live in the United States. 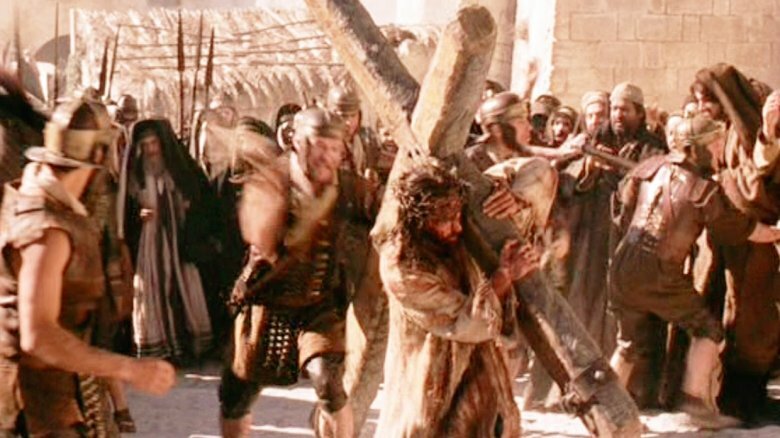 Because you can't exactly flay the skin off your star in real life, a hidden whipping post was set up behind Caviezel while filming The Passion of the Christ's notoriously bloody scourging scene. Problem was, one of the actors doing the flogging didn't have the best aim when swinging overhand. "[His lash] just extended over the board and hit me with such a velocity that I couldn't breathe," Caviezel recalled to Today. "It's like getting the wind knocked out of you. The stinging is so horrific that you can't get air." Unsurprisingly, Caviezel wasn't happy. "I turned around and looked at the guy, and I tell you, I may be playing Jesus, but I felt like Satan at that moment … a couple of expletives came out of my mouth." Some good that did. Moments later, Caviezel accidentally received another blow. Nobody ever said playing Our Lord and Savior would be easy. Not only did Caviezel get struck by lightning and endure a couple misplaced lashes, he also dislocated his shoulder while carrying the film's massive crucifix. According to the cross-bearer himself, the wooden construction weighed 150 pounds. "It feels like 600 pounds as the day goes on," Caviezel told Fox News. Caviezel's shoulder popping out of place was just the start of his misery. "Later they stick you up on a cross in 25-degree temperatures with 30-knot winds," Caviezel explained. Filming almost naked in such frigid conditions nearly gave the actor hypothermia, and succeeded in giving him a lung infection and pneumonia. But hey! At least he didn't get migraines, right? Just to add the icing on Caviezel's painful cake, the actor regularly suffered severe migraines from working day in and day out with one eye cosmetically swollen shut. According to Today, Caviezel's alarm went off a 2AM in order to provide enough time for the film's makeup artists to cover him in cosmetic bruises, cuts, lashes, gashes, and copious amounts of fake blood. 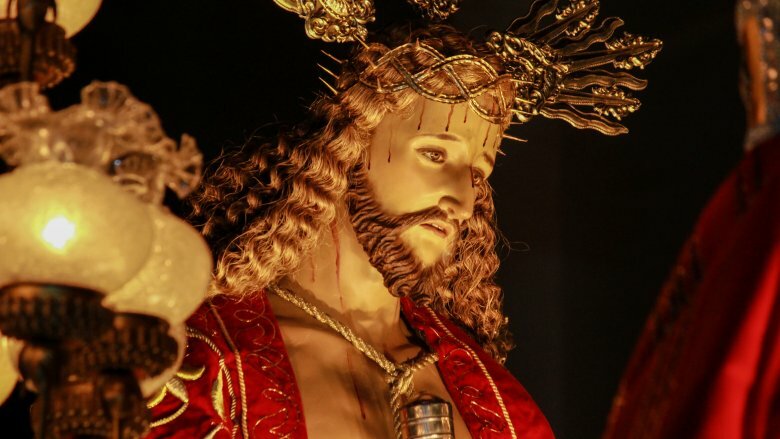 They also had to arrange his crown of thorns, and seal one eye shut — which wreaked havoc on his depth perception. "You are going to work every day with only one eye functioning," he told Fox News, "which gives you headaches." And you thought eye strain from your office job was bad? One actor who converted from being a self-proclaimed "angry atheist" was Luca Lionello, the actor who plays Judas. Near the end of production, Lionello accepted the film's title character as his lord and savior. "He asked for confession," Bartunek explained. "Apparently he had been completely transformed by the experience. 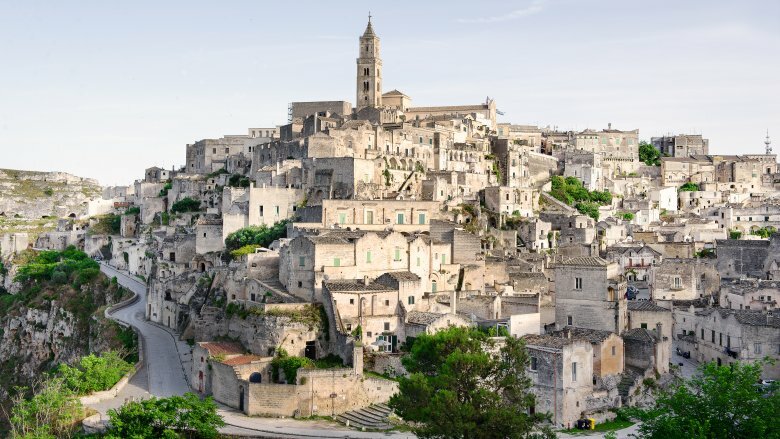 He baptized his children, sanctified his marriage and came back to the Church." Not only did the film have a profound effect on the atheist actor who played Judas, it affected a cast member of the Islamic faith. "One of the guys working on the film was a Muslim," Caviezel told The 700 Club. "He was one of the guards who beat me, and he converted. He had a real big experience there, you know?" Naturally, not everyone who worked on the set of The Passion of the Christ experienced a religious epiphany — but most people were affected in one way or another. "All the actors that worked on this film … it will stay with them the rest of their lives," Caviezel claimed. "People will always come up to them, people will always ask them about the movie they were in, it will always be with them." During the filming of The Passion of the Christ, Caviezel had to endure accidental lashings, a dislocated shoulder, pneumonia, a lung infection, persistent migraines, and getting struck by lightning — but the bad luck didn't end there. Once filming wrapped and the movie made millions worldwide, the actor's career all but died. In addition to calling Mel Gibson "a horrible sinner," Caviezel has claimed he's been blackballed by Hollywood for playing Jesus. In fact, he's recalled Gibson trying to talk him out of it only moments after offering him the controversial role. "He said, 'You'll never work in this town again,'" Caviezel told a congregation at First Baptist Church of Orlando. "I told him, 'We all have to embrace our crosses' … We have to give up our names, our reputations, our lives to speak the truth." Still, Caviezel's career might be due for a resurrection, with the actor set to reprise his most famous role in Gibson's upcoming sequel to The Passion. "I won't tell you how he's going to go about it," Caviezel told USA Today. "But I'll tell you this much, the film he's going to do is going to be the biggest film in history. It's that good." With plenty of bizarre happenings taking place on the set of the original, we can only imagine what's in store for the sequel — although we're definitely hoping for fewer lightning strikes.